Valley Interfaith’s LONG TERM STRATEGIC PLAN was developed under the guidance of a professional strategic planner with the input of volunteers, donors, and clients, as well as with data and research. The plan includes new MISSION AND VISION STATEMENTS, new CORE VALUES, and 3 MAIN GOALS. Our Executive Director will oversee the successful implementation of the Strategic Plan. The goals of the plan will be achieved by implementing the Strategies and Tactics developed with the help of the strategic planning professional. Implementation Teams are being developed which will include staff and trustees. Partnering with the community to provide necessary resources and build self-sustainability. Goal 1: Provide quality programs and outreach to the community. Goal 2: Design an effective and transformative organizational structure. Goal 3: Ensure a sustainable financial future for Valley Interfaith. 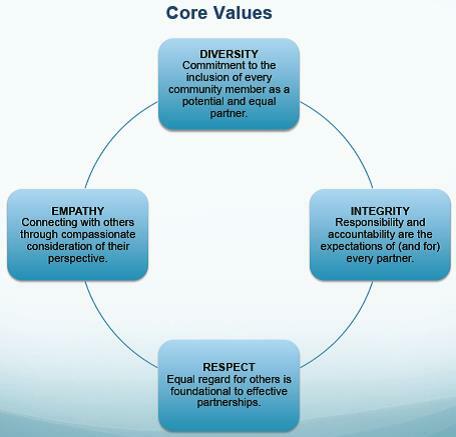 Evaluate all programs to ensure excellence and that they address community need. Design an effective Valley Interfaith governance structure to ensure professional oversight. Create a comprehensive three to five year financial plan to fund current and new programs. Ensure all clients receive compassionate and quality services. Develop a transparent organizational structure that assures accountability and compliance. Sustain, redesign and/or expand transitional programs. Recruit, train and retain a skilled workforce committed to providing services to our clients. Evaluate and implement pilot sustainability programs. Foster commitment and implementation of a unified vision and strategic plan.